“GNM Tyrell has put forward the terms ‘divergent’ and ‘convergent’ to distinguish problems which cannot be solved by logical reasoning from those that can. Life is being kept going by divergent problems which have to be ‘lived’ and are solved only in death. Convergent problems on the other hand are man’s most useful invention; they do not, as such, exist in reality, but are created by a process of abstraction. When they have been solved, the solution can be written down and passed on to others who can apply it without needing to reproduce the mental effort necessary to find it. If this were the case with human relations – in family life, economics, politics, education, and so forth… – well, I am at a loss how to finish the sentence, there would be no more human relations but only mechanical reactions; life would be a living death. Divergent problems, as it were, force man to strain himself to a level above himself; they demand and thus provoke the supply of, forces from a higher level, thus bringing love, beauty, goodness, and truth into our lives. It is only with the help of these higher forces that the opposites can be reconciled in the living situation. That, I think, nicely sets the context for this article. When I was in secondary school, a decade before the collapse of the Soviet Union, I used to frequent a well-stocked Russian library, where I discovered the most beautiful books on science and maths. They had intriguing names like: ‘Experiments without explosions’, ‘This chancy, chancy, chancy world’, ‘Physics in your kitchen lab’, etc. 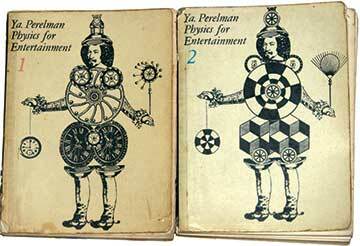 ; but the most enchanting ones I found were two books called ‘Physics for Entertainment’ written by Yakov Perelman. “The aim of this book is not so much to give you some fresh knowledge, as to help you learn what you already know’. In other words, my idea is to brush up and liven your basic knowledge of physics, and to teach you how to apply it in various ways. To achieve this purpose conundrums, brain-teasers, entertaining anecdotes and stories, amusing experiments, paradoxes and unexpected comparisons all dealing with physics and based on our everyday world and science-fiction are used. The books are full of things that I find fascinating and it was difficult to choose an example to illustrate the refreshingly different tone. I finally settled on one (see box) because of its brevity. I have had the two volumes of ‘Physics for Entertainment’ for so long that I cannot now remember where I picked them up. You see, the problem is that Mir, the publishing company that brought out these popular science books, shut shop when the Soviet Union collapsed. So the only way to get the books was at old book shops or on the pavements of Daryaganj in New Delhi, or its equivalent in the other big cities. Also, it was pretty obvious that people who had these books in their collections would let go of them only when they were senile or dead. I had not looked at the ones at home for a long time, when recently, a chance conversation put them firmly back in my mind. I was talking to some people from an NGO that works on school improvement and they had just got somebody to do an interactive physics workshop for a middle school. The people from the NGO were very sure that the workshop had been inspirational for the attending children but they were wondering how the model could be scaled up given its cost and the logistical impossibility of getting these inspiring science educators to all the schools that need them. And I got thinking of how I had been inspired to learn physics not from inspiring educators, but from inspiring books like ‘Physics for Entertainment’. That, like probably only books can do for most of us, connected my heart to the large mysteries that other humans before me had wondered about. What is heavier – a ton of wood or a ton of iron? Some heedlessly answer that the ton of iron is heavier, thus raising a laugh at their expense. The questioner would probably laugh still louder were he told that the ton of wood is heavier. This seems absolutely incredible, but it is true, strictly speaking. The point is that Archimedes’s principle can be applied not only to liquids but also to gases. In the air, every object “loses” in weight as much as the volume of displaced air weight. Wood and iron also lose a part of their weight, and to get their true weight, you must add the loss. Consequently, the true weight of the wood in our case is one ton plus the weight of the air it displaces. The true weight of the iron is also one ton plus the weight of the air that the iron displaces. However, a ton of wood occupies a much larger space – about 15 times more – than a ton of iron. Hence, the true weight of a ton of wood is more than that of a ton of iron. Rather, should we say that the true weight of the amount of wood which weighs a ton in the air is more than the true weight of iron which also weighs a ton in the air. Since a ton of iron occupies a volume of 1/8 m3 and a ton of wood a volume of about 2 m3, the difference in the weight of the displaced air should be about 2.5 kg. It is by this amount that a ton of wood is really heavier than a ton of iron. The author got his degree from IIT Kharagpur in 1988 and then failed to capitalize on it as he drifted through engineering consultancy, software development, e-learning and ended up as a writer of articles on school education. He currently works with WATIS and carries the rather cool designation of Wipro Education Fellow. He can be reached at arunelassery@hotmail.com.